What if I say that money spent on some of the useless grow lights might hurt your expectations Yeah, it’s true, and that’s why we’re here with Viparspectra 600W Review. In this review article, we’ll reveal all the secrets behind its fame. After reading this review, you’ll be sure of one thing that whether you should opt in for viparspectra 600W or not. We all know that Light is the most essential and vital factor in any plant’s well-sustained growth. They need real sunlight, but that’s not possible to provide them with real sunlight all the time when we plant to set an indoor garden for our marijuana plants, right? It gives a precise idea that whenever we look for a grow light suitable for marijuana plants on the market, we should hunt for one which is capable of generating the maximum possible effect that’s been observed in real sunlight. Moreover, in this review article, we’ll focus more on quality of light than other factors which don’t matter. Viparspectra is offering two variant in 600W segments. Yeah, reflector series and PAR series. As far as this review is concerned, we’ll take an in-depth look at Reflector series only. 1.1.4 Coverage Ability – Capable of covering multiple plants. 1.1.5 Cooling – Well balanced and Hazard-free environment for plants. For better understanding, we’ll divide this review into several parts. So, let’s start with its features. Here are all the features of Viparspectra 600W Reflector Grow Light. Viparspectra Reflector 600W is a scientifically engineered grow light that makes wonder in many indoor growers grow space. While designing this grow light Viparspectra Have kept Better health and growth of the plants in mind. Total 120 LEDs of 5W each is equipped on the panel to enlighten your grow space up to the maximum extent possible. These diodes are manufactured by well-known manufacturers out there like epistar and bridgelux. The inclusion of the reflector makes it a masterpiece which is highly capable of magnifying the effect of light. It also helps your grow panel to spread light evenly all over your grow space. 90° Degree Angle of LED also helps in providing direct light over your plant canopy. It prevents light loss. Moreover, it helps in balancing PAR/Lumen output and in the distribution of equal intensity of light for your marijuana plants. 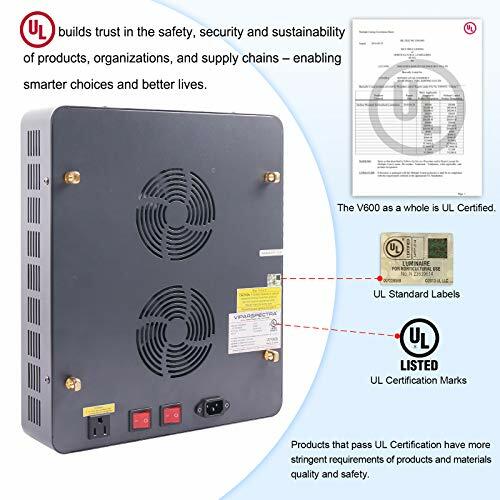 PAR Recorded by this grow panel from the height of 24″ was 456 uMol. Here’s the image. If you’re a beginner gardener or it’s going to be your first harvest using LED grow light, then it gives you the freedom to excel your grow space once you get familiar with growing. Yeah, you won’t need a separate socket for another grow panel as this comes with daisy chaining feature. Daisy chaining allows users to extend another grow light with this grow light directly. And, we all know that our plants love the intense light, more the brightness, more the yield. 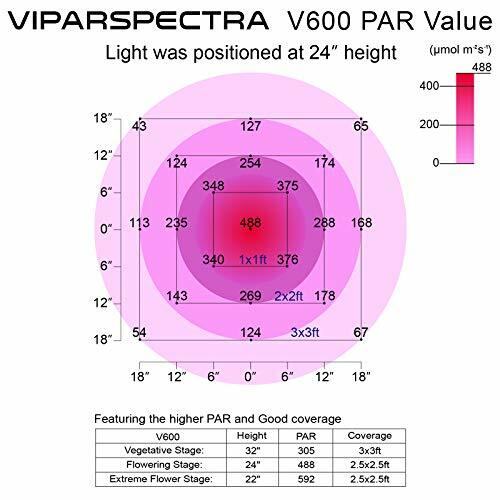 Viparspectra 600W grow light produces a 12 band spectrum which ranges from 440nm – 730nm. Yeah, it includes IR as well. As we talked, earlier this spectrum is highly capable of creating wonder inside your grow space. All the vital and essential bands that your plants crave for are included in this high quality grow light. The shade of light generated by viparspectra reflector 600W is purple, and a hint of pink can be seen in it when bloom mode is ON. This ratio of Red: Blue tells everything about light quality. If you’re a beginner, then you must know that RED is the essential spectrum for plants in bloom. On the other hand, blue is the most vital spectrum for better growth and sustainability during seedling and vegetation. So, all in all, this light can be considered as one of the best 600W LED Grow light in this price segment with complete spectral abilities. When it comes to the power efficiency of a LED grow light people thinks that a 600W LED grow light will pull 600W from the wall and will give them the burden of electricity bills for life. However, it might be true if you use any cheap and low-quality light but not in the case of Viparspectra, Yeah, it only pulls 269W±3% from the wall and that too when it’s in operation with blooming mode ON. Otherwise, it pulls less than that. Yeah, this grow lights features two separate mode switches for ease of use. You can control it any way you like to. The veg mode will spread more of blue light while bloom mode will enlighten your grow space with an eye-catching reddish shade of light. However, for better results, you can keep both modes ON during blooming. So that, your plants get all the necessary bands for better and improvised photosynthesis process. Even at very low power consumption, it won’t disappoint you by its brightness and intensity as it’ll remain equivalent to a 600W HPS system. Coverage Ability – Capable of covering multiple plants. Now, comes the most important and must to consider factor while making any grow light decision. Yeah, it’s much vital and essential element of an entire decision-making process. Here’s a rule of thumb, more the coverage, more the number of healthy plants, more the yield. Yeah, in such a case viparspectra performs up to the markand is capable of covering a uniform area of 3’ X 3’ during vegetation with ease. On other hand, it can cover 2.5′ X 2.5′ during blooming. It’s best in the segment as far as price and number of actual wattage are concerned. Even at this large area, you need not compromise in light quality. However, for better results, we’d suggest you keep light nearer to the marijuana canopy during blooming. Yeah, for extraordinarily bright and more intense quality of light. Cooling – Well balanced and Hazard-free environment for plants. If you’re using that old-fashioned and traditional HPS grow panels, then you might have experienced terrific level of heating inside your grow space. Yeah, those lights are harmful to your plants and may result in leaf burn problems. We’ll suggest you to avoid HPS and MH to get rid of the headache of Heat and disturbed temperature inside your grow box. 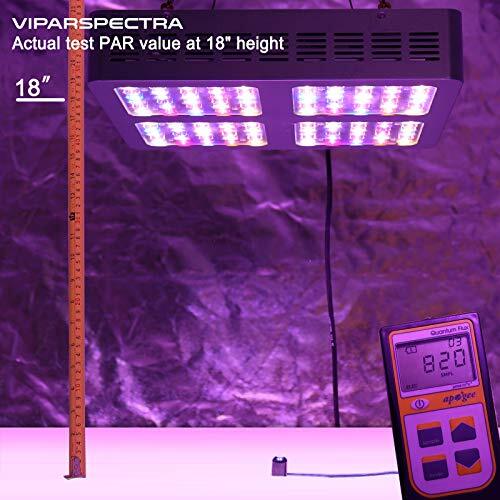 Viparspectra 600W grow light offers you worry-free experience as far as cooling is concerned. Yeah, multiple cooling fans and modern and scientifically designed aluminum heat sink takes very well care of your grow panel as well as grow space. It runs comparatively very cooler than any other cheap grow lights. Aftersales support matters when you spend a hefty amount of your hard earned money on anything. Moreover, viparspectra provides very reliable and customer friendly support for 3 years. Also, they also offer 30 days complete money back warranty if you don’t feel happy with the product quality or performance or whatever. However, Looking at the performance of the manufacturer it seems like the need of support is rare in their products. Yeah, winning the heart of thousands of indoor weed cultivators and getting clapped for the performance which makes it stand out product from others. 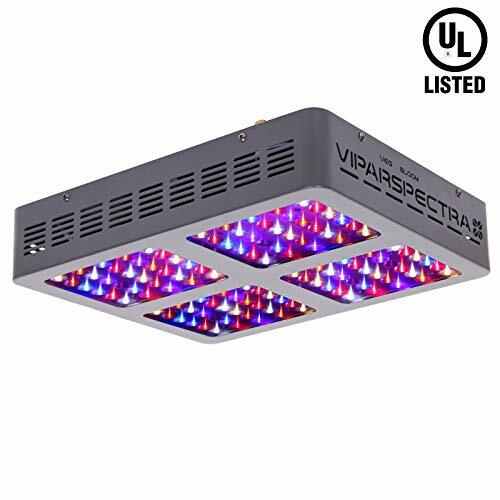 If you’ll take a look at product reviews and ratings for viparspectra Reflector Series 600W LED grow light, then you’ll realize that Viparspectra succeeded in satisfying a significant number of customers. No, we’ll not reveal the secret here. Now, In this Viparspectra 600W Review, We’ll take a quick look at its bright and dark sides to get a perfect idea whether it deserves a place in your grow space or not! Protection glasses, required to get into contact with direct light. 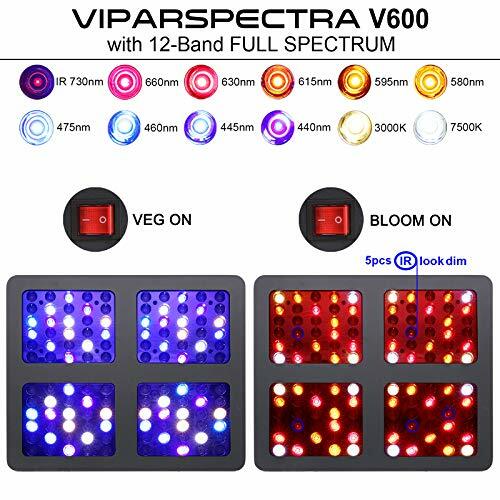 Apart from a Viparspectra Reflector Series V600 Grow Light package includes several other types of equipment as well to make things easy for you. It includes one Daisy chaining cord to extend another grow panel directly with this grow light without worrying about external socket. One hanging kit is provided to make installation of this grow light easy for you. Yeah, hook at all four corners of the panel and hang it on the handle of your grow room. One user manual is also provided in case you need to know its functioning it’ll help you. One power cord is provided to connect this light with your power outlet and getting things on work. Don’t worry it’s long enough to keep you worry-free. There are several tips that we’d like to share with you in this Viparspectra 600W review. We assure you best possible performance out of this masterpiece. Light is not waterproof, and that’s why it’s advisable to keep it away from dripping water. It’ll extend the lifeline of this grow panel. If possible, then use exhaust or inline fans to keep heat away. As this grow, light can work up to its maximum potential with an external temperature of less than 40 Celsius. You can control it using the timer. So if you’ve any spare external timer then control it using that timer. It’ll help you in saving more electricity. If you don’t have a timer, then you can buy it from Amazon. It doesn’t cost much. Keep light operational for the maximum of 16 hours a day and not more than that as some darkness is also vital for your plants and that natural. Don’t run light in Bloom mode unnecessarily. Keep an eye on your plant’s growth and health. 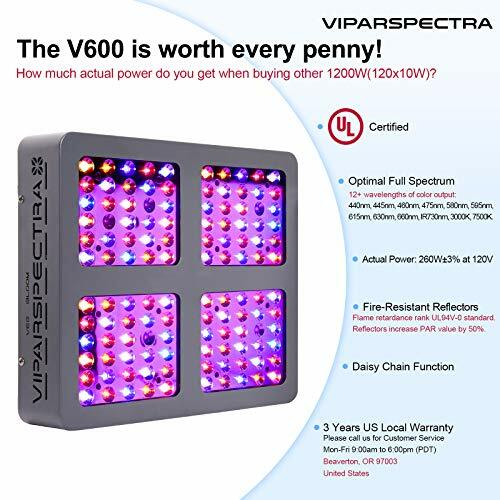 However, if you’re still feeling confused then let me help you a bit and give an entire overview of this viparspectra 600W review in fewer words. If you’re an amateur grower or just starting into indoor growing, then we don’t recommend you to go for premium grow lights like Advanced Platinum 600W LED and G8LEDs 600W Variant. Because those lights are suitable to those, who are familiar with plants lifecycle. 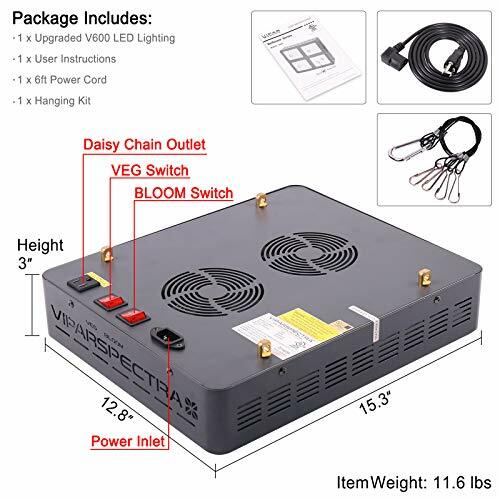 As far as Viparspectra 600W is concerned, it is very user-friendly and high quality grows light that provides all the vital bands required in a quality light for green marijuana plants. Looking at all its abilities and capabilities, we’d recommend this grow light for everyone who requires a better quality light for 3’ X 3’ of grow space and don’t want to spend hundreds of bucks in the electricity. A Definite Good To Go With Product As All Its Fame Is Real.